You have great products, a beautiful website design and a smooth checkout process. You’ve also done everything recommended by conversion rate gurus out there to increase your online sales. Yet, does your company have a compelling and recognizable brand experience? Branding your company is a serious undertaking, but doing so reaps bountiful rewards. Creating a consistent, convenient and compelling customer experience generates increased word-of-mouth recommendations for your business, which in turn increases your conversion rate. In fact, Nielsen’s latest Global Trust in Advertising Report found that 92% of consumers trust recommendations from family and friends above all other forms of advertising. So, impress a customer, have that customer tell his or her friends, then rinse and repeat day after day, and you’ve got yourself a successful company.Whether you’re building your brand from the ground up or are looking to strengthen your existing one, the following tips work to create much more than just a company. Rather, these tips help you to build a reputable and consumer-centric brand. Are you trying to focus on too many categories? Take a step back and re-evaluate your strategy here. Focusing on too many categories at the same time can dilute your brand. Instead, keep a check on the number of product categories in which you are selling, ideally focusing in on one category in which you can excel. We’ll call this your core product category. Your core product category is the category in which your brand offers the best-in-market product or solution. This category is your brand’s birthplace.For example, Warby Parker was birthed from the idea of providing affordable and fashionable eyewear. Bonobos was birthed from the idea of providing better fitting pants for men. ModCloth’s beginnings stem from women’s vintage dresses and Burberry’s from a fashionable trench coat. All these brands have one thing in common: a core product offering consumers recognize. When selling online, customers can’t touch and feel your products which means that your products are only as good as they look in your product pictures. This is known as the perceived value of your brand, which is what a customer believes your product to be worth when he or she agrees to pay for it. “I launched with 12 pieces, and everything had a starting auction price of $9.99, with no reserve. Girls would just freak out. I shipped worldwide, and there would be a girl in New York City and a girl in Sydney fighting over something really awesome: everything from Mongolian fur jackets to weird plus-size ladies anoraks that I made to look really avant-garde. I just tried to elevate everything, whether it was exciting or not. In essence, perceived value generates actual value. Intrigue: This involves creating a compelling identity (i.e. a quirky logo, typography, colors, shapes and other graphic elements) and marketing messages to increase customer curiosity. Desire: Create compelling editorial content to inspire your customers to be an active part of your brand. This means creating a lifestyle persona associated with your brand that appeals to your target customer. Trust: Provide your customers with a high-level of trust and comfort via security badges and secure checkouts. You can also generate trust by being as transparent and honest with your customers as possible in your brand narrative, product reviews, customer stories and press mentions. This strategy has worked particularly well for Buffer, a social media scheduling software. Fear: Allow your CTAs to create a sense of urgency for your products, brand news and more. Use email newsletters to announce flash sales, helping to build your email list as well as generate repeat purchases. The fear you are generating here is simply FOMO, or the fear of missing out. Surprise: Add an element of surprise to your website’s shopping experience in any way possible. 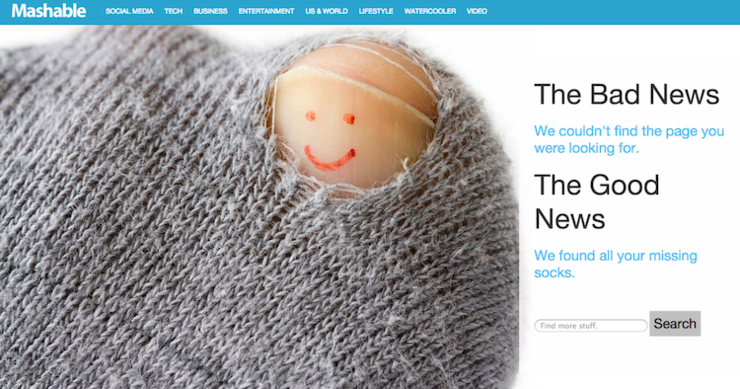 Many sites use their 404 pages to showcase their brand personality. Take a look at Mashable’s, below, for instance. In all, let your brand’s personality shine through and remind shoppers that there are real, relatable people behind the brand. Choosing an enemy is just another way of saying “Have a purpose.” In essence, know what you are fighting for, what it is you are trying to change, and encourage others to become part of your mission, too. “The first goal was to transform a $65 billion industry that had been ripping consumers off for decades by creating our own vertically integrated brand,” said David Gilbo, co-founder of Warby Parker. Like Warby Parker, there has to be something that’s driving all your branding decisions. Knowing your purpose will give you a clear sense of what you want your brand to be like, sound like and do. It will help to drive which events you take part in and which you let slide by. It will also help to identify niche markets of people who also support your cause. All the hard work you have done in positioning your brand can go wasted if your efforts lack consistency. You have to provide your customers a consistent experience throughout all possible touch points. Doing so will not only increase your brand recognition, but also your perceived value in terms of trust, quality and commitment. Copywriting: Be consistent in the tone of your product descriptions, the usage of words and the length of the copy. Make the voice representative of your brand personality, which should reflect someone who relates well to your target customer and is a voice they trust. Images: Similarly, be consistent with your images. Maintaining consistency in lightning, backgrounds, camera angles and editing so that there is a signature style in all your product images. NastyGal, for example, uses the same models time and time again. You can even get to know them by name. In all, your images project who your brand is, so make sure every image you publish is cohesive with your overall branding. Delivery experience: And there are other kinds of consistencies that are important, for example – delivery experience. It means that the product on delivery should look exactly as it looked on your product page. One final piece of advice: lead from the front. Be the face of your brand. Embody your brand persona. Be a storyteller. Take every opportunity that comes your way to speak, write and tell the story of your brand in your own words, to as many people as you possibly can. After all, word of mouth marketing is the most effective marketing there is. Have any further questions about brand building and positioning? Please feel free to leave them in the comment section below.